372 pages | 25 B/W Illus. Sport is a global phenomenon engaging billions of people and generating annual revenues of more than US$ 145 billion. Problems in the governance of sports organisations, fixing of matches and staging of major sporting events have spurred action on many fronts. Yet attempts to stop corruption in sport are still at an early stage. 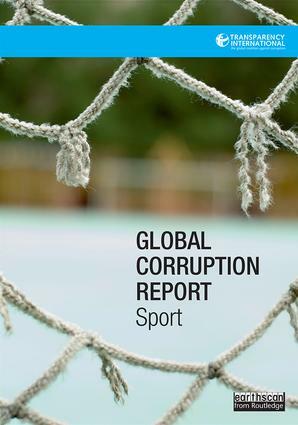 The Global Corruption Report (GCR) on sport is the most comprehensive analysis of sports corruption to date. It consists of more than 60 contributions from leading experts in the fields of corruption and sport, from sports organisations, governments, multilateral institutions, sponsors, athletes, supporters, academia and the wider anti-corruption movement. This GCR provides essential analysis for understanding the corruption risks in sport, focusing on sports governance, the business of sport, planning of major events, and match-fixing. It highlights the significant work that has already been done and presents new approaches to strengthening integrity in sport. In addition to measuring transparency and accountability, the GCR gives priority to participation, from sponsors to athletes to supporters an essential to restoring trust in sport. Transparency International (TI) is the global civil society organisation leading the fight against corruption. Through more than 100 chapters worldwide and an international secretariat in Berlin, TI raises awareness of the damaging effects of corruption and works with partners in government, business and civil society to develop and implement effective measures to tackle it.